They are a group of stilt walking musicians who have brought all of their experience in performing as part of other companies into their own stilt walking band. 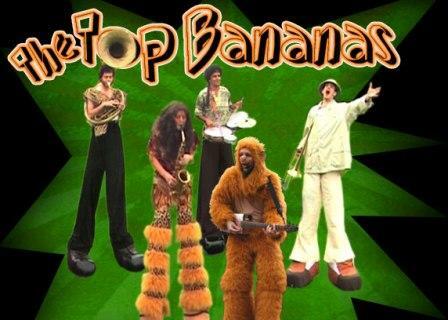 The Top Bananas play music on stilts and are based in Brighton, England. This band on stilts features an oil can guitar, harmony vocals, a horn section and a rhythm section. The band is all about fun and plays selections of Jazz, Funk, Disco, Rock n Roll, and Ska classics. Bespoke themes and costumes possible with enough notice!